Vehicle powertrains are subject to a variety of demands, typically requiring major time and financial investments in order to meet expectations regarding driving performance, emissions, durability, and fuel consumption. To reduce development times and simplify the complexity of parameter-setting, Daimler approached the Steinbeis Transfer Center Traffic Engineering.Simulation.Software. The aim was to develop new test rig control system for powertrains. 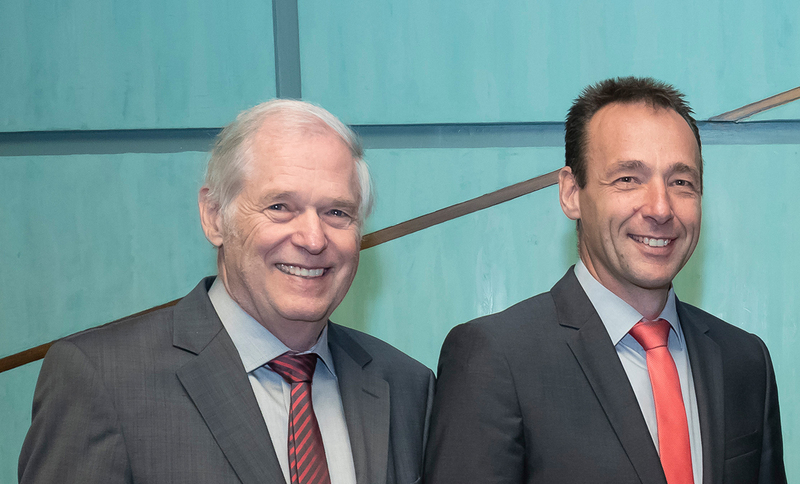 The project partners were honored with the Steinbeis Foundation Transfer Award – the Löhn Award – in recognition of the innovative and forward-thinking nature of the project. To keep the development cycles of vehicle powertrains as short as possible, companies use computer and test rig simulations. They also conduct test driving. When testing the vehicle, real route data is recorded, which serves as a basis for the simulations. From a control engineering point of view, it can be extremely difficult to replicate measured driving cycles on a powertrain test rig. This is because different elements within the powertrain can have extended downtimes and are non-linear in terms of functionality. With the previously applied techniques for drawing on data measurements to control test rigs it took a great deal of time to set up parameters, and often this resulted in inconsistent test rig setups and thus unrealistic findings. Daimler, based in Stuttgart, asked its representatives of powertrain development and the company’s powertrain testing facility to contact the Niederstotzingen-based Steinbeis Transfer Center (STC), Traffic Engineering.Simulation.Software, with the aim of developing a test rig control system for powertrain technology. To work out the optimal design of powertrain components, load collectives are needed at an early stage. This involves working out topologies for powertrains and simulating these in coordination with specialized departments using winEVA. This ensures a perfect fit between the design and later testing on a test bench. The ideal test bench controls were worked out by the Steinbeis expert Jakob Häckh. His idea was to map the controlled system as a parallel simulation model and to use this for continually comparing data produced by the model with the actual powertrain. “Every driver drives differently depending on the kind of driver they are, or the vehicle engine, so it’s only normal for a powertrain to react differently. We had to program all of these factors in real time. The solution was to run the flexible winEVA driver model in the IMC control system parallel to the control,” says Jakob Häckh. To finally solve this new problem, the experts selected a combination between “control” and “regulation.” For the test rig control part of the equation, real-time simulations of the powertrain were carried out using winEVA under testing conditions. Adjustment variables, gas pedal settings, and wheel rotation speeds could then be transmitted to the testing facility. Reactions on the test rig are then compared to the simulation model, and any differences between test bed behavior and the simulation model are used to make adjustments to this model. Within a short time, the project partners succeeded in adapting the winEVA simulation software already developed by the Steinbeis Enterprise to the requirements of the test rig. To test new functions reliably, Daimler set up a simulator. Daimler first started rolling out the winEVA simulation tool to powertrain test rig in 2011. The updated version, winEVA plus, works independently of specific automation systems, so it is virtually adaptable to use with any powertrain test rig. Daimler can now use the winEVA simulation software to replicate all kinds of existing and future powertrains, as well as actual driving on roads. By carrying out calculations and experimenting on test beds, the design and duration of different types of parts can be optimized even during early-stage development. This saves Daimler significant time in development. This fundamental approach has been fine-tuned and updated many times over the years, such that it is even possible to use control technology to manage highly dynamic, purely electric powertrain systems, as well as 4×4 drive train based on complex four-wheel drive principles. The project partners have been honored with the Steinbeis Foundation Transfer Award – the Löhn Award – in recognition of the innovative and forward-thinking nature of the project and the manner in which the development partnership continues to build on the success of the collaboration. The partnership is also being continued. The partners are currently developing an online monitoring tool for test rigs using winEVA plus. This will allow developers to monitor stress placed on parts even more quickly and accurately. Jakob Häckh and his deputy Prof. Dr.-Ing. Günter Willmerding head up the Steinbeis Transfer Center Traffic Engineering.Simulation.Software. The main areas of work of the Steinbeis Enterprise are: the simulation of powertrains, fuel consumption, emissions, and oscillation; the real-time control, design, and calculation of new kinds of vehicle parts using FE methods; service life prediction; winADAM, winEVA and winLIFE.